I lost one of my cats recently to liver disease. I nursed her at home, choosing to keep her comfortable and give her the care she needed to the end. Found on the side of the road at two weeks, she was gifted to me at one month. I didn’t know what to name her when I got her. She was pretty feral from her experience of being tossed aside like somebody’s discarded McDonald’s hamburger bag. Morgan le Fay, my vet named her, after a woman of supernatural powers, according to Irish legend. The last weeks of her life, Morgan developed her own language. She sat with me, something she never did before, lying quietly while I gave her IV fluids to keep her hydrated. She purred a lot, loudly at times. At the end, she called out a few times as her life was leaving her and meowed one last time before she took her last breath, her head in my hand. I’m glad I was there to listen. With the change of seasons, there are quiet and not so quiet exchanges going on in the barn. It’s breeding time. Every 21 days or so, one or all the dairy girls experience body cycles signaling that it’s time for a visit to Mr. Neptune on Brian’s farm. There’s an order to the herd, Dollie being herd queen. In goat language, the queen goes first to the milking stand. Smooth, quiet, unassuming Dollie. Nothing fazes her. Her mere presence and body language say it all. Confident and assured. But it hasn’t always been so. 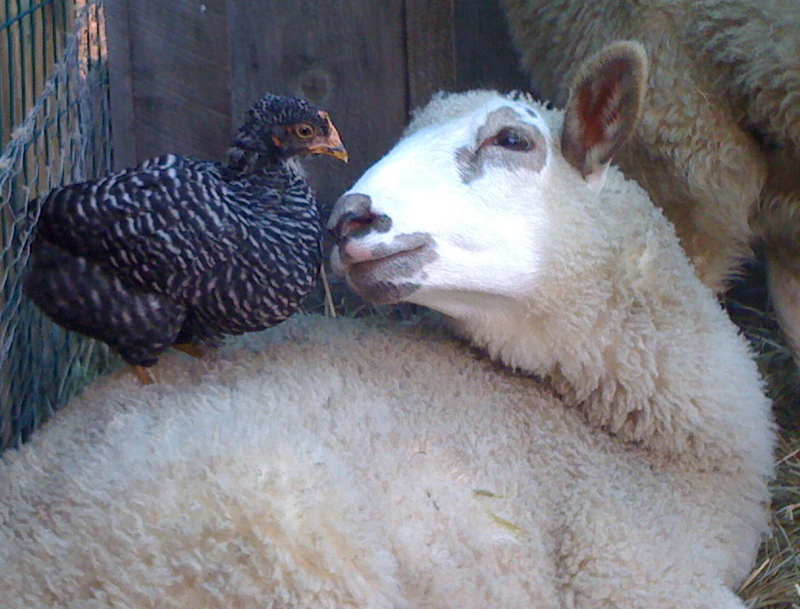 In her former herd, small Dollie was the one bullied. The larger girls took full advantage. But now that Frannie is attempting to dethrone Dollie and advance as herd queen, Dollie isn’t repeating the cycle. It’s a beautiful display of compassion by one who comfortably holds the top position and doesn’t need to assert force to maintain her status. Like teaching a child by allowing him to go through his own motions, the lesson is learned. Sometimes, as in Frannie’s case, the lesson is repeated. We all learn at our own pace. The children’s book Doctor Doolittle touts communicating with animals and witnessing their communication among one another as an acquirable skill. Farmers have opportunities on a daily basis to hone their powers of observation. Lately, for me this has included watching new turkey poults running from end to end of the barn, testing their wings, and picking at stray bits of grain, tiny bits of fluff and feathers already in full display, communicating their maleness. Amazing. The poults wander into the stalls, where 150-pound creatures gently greet them with soft pink noses. Curious. Long, agile legs move slowly as the tiny visitors wander in and out. Miraculous: sharing space with no rules except to watch out for one another. Winter is moving slowly in. The air is crisp. Milk buckets and totes are all but stored away. One more week of milking with Sea Princess. Dollie was dried off long ago for a good, solid rest. Frannie started her process this week. Jack Fergus and Co. have been busy courting. The flock has seen its way through the heat of summer. Winter coats are already getting that wooly look to them, reminding me of last year’s snows. The days are shorter now. Color comes in long, sharp rays. Cheeses are stored, milk bottled and frozen. Fat jars of applesauce, pumpkin, and blueberry sauces fill the shelves. Three different knitting projects are in progress. Christmas fairs at our two Grange Halls are coming soon. The spinning wheel is calling from the corner. Canada geese fly over daily in great “V” shapes, signaling their journey south, where winter will be kinder. The chatter between these giant honking birds relays messages of resting places, changes in formation, feeding sites. Meanwhile, the loons call in pairs, floating on salty, cold water at Drift Inn Beach. It’s the best time of the year for strolls at low tide in the crisp cool fall mornings when chores are finished. Animals don’t seem to need the reassurance of a lot of words as we humans do. 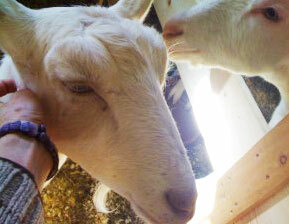 A gentle pat on the head, a nudge against your leg, being close seems to be more what they’re looking for. My bottle lambs still call to me when their bellies need a bit more food, but generally they go about their business of being in a quiet way. My dairy girls call from the pasture when they see me coming to take a walk with them, but they’re much more interested in bumping against my legs and nudging my hand than listing off their needs. I whisper a thank you to them each time they finish their grain on the milking stand and scratch them in their favorite spots, but words hardly seem necessary for us to understand each other. I believe the language of animals is a world all its own. It seems a serene place. My animals have brought me a quieter sense of communication and taught me to listen closely to the small sounds, rather than the clatter around and outside me. Human chatter diminishes in importance when I’m walking through the pasture or sitting in the barn, enjoying some time lost in the wonder of the animals’ exchanges. Listening to the quietness of their world takes no effort. Showing up is all that’s required. That speaks louder to me than any words. It’s a quiet place I’ve come to appreciate. A sanctuary from what we call life, with all its complications and lessons. Maybe listening to a Canada goose flying south for the winter is all the lesson we really need: one of following our instincts, staying true to our own kind, and asking for nothing more than some soft ground to land on, a fully belly, and a flock to connect with on our journey. 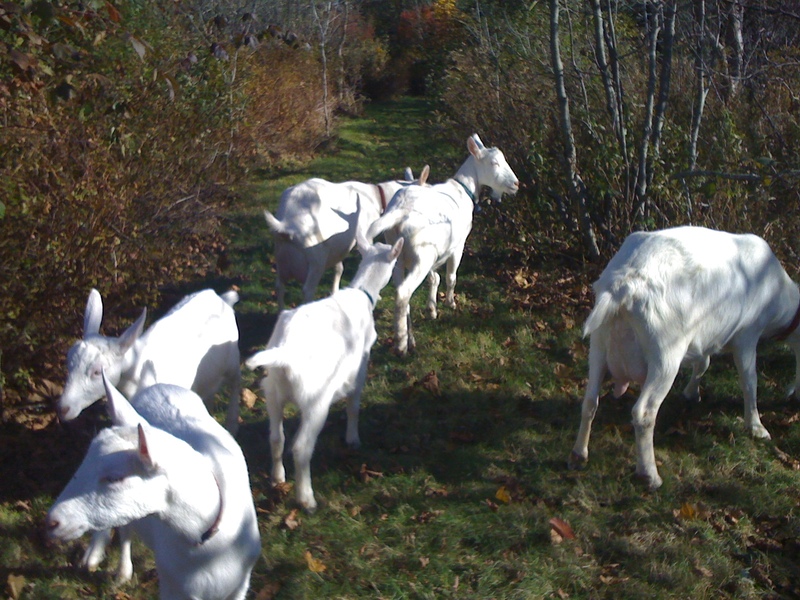 Dyan Redick describes herself as “an accidental farmer with a purpose.” Her farm, located on the St. George peninsula of Maine, is a certified Maine State Dairy offering cheeses made with milk from a registered Saanen goat herd, a seasonal farm stand full of wool from a Romney cross ﬂock, goat milk soap, lavender, woolens, and whatever else strikes Dyan’s fancy. Bittersweet Heritage Farm is an extension of her belief that we should all gain a better understanding of our food source, our connection to where we live, and to the animals with whom we share the earth.